Archaeologists in Turkey's eastern Van province discovered the ruins of a 3,000-year-old Urartu castle during underwater excavations in lake Van. The excavation led by Van Yüzüncü Yıl University and Governorship of Turkey's eastern Bitlis Province revealed that the underwater ruins are supposedly from the Iron Age Urartu civilization, also known as the Kingdom of Van, thought to date back to the eighth to seventh centuries B.C. 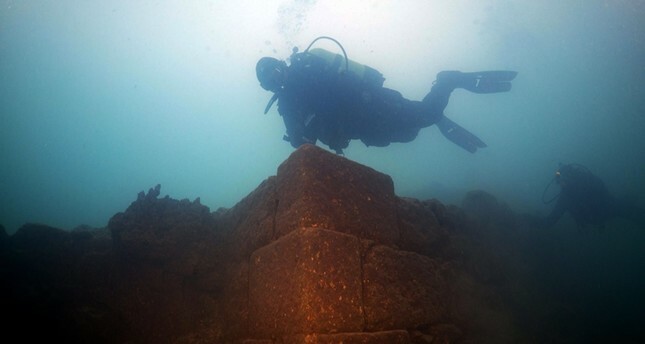 "There was a rumor that there might be something under the water but most archaeologists and museum officials told us that we won't find anything," the head of the diving team Tahsin Ceylan said, adding that they proceeded with the research and discovered the ancient castle. The current water level of Van Lake, which has a history of 6,000 years, is reportedly several hundred meters higher than it was during the Urartu civilization. Civilizations living around the lake set up large villages and settlements while the water level of the lake was low, but they had to leave the area after it increased again, Ceylan said. The research couldn't determine how much of the walls of the castle are buried, but about three to four meters are seen above the water. "We will have to hold underwater excavations to find out about that" he added. The underwater ruins are expected to attract the interest of thousands of tourists due to its unique historical worth. Lake Van is the largest lake in Turkey and the second largest in the Middle East. It's also the biggest sodium water lake in the world. The lake lies on the high grounds of Eastern Anatolian region near the border with Iran. It was formed by a crater caused by a volcanic explosion of Mount Nemrut near the province of Van.